I’m no expert but I have managed to run the 89km Comrades Ultra Marathon, in South Africa, a few times. I was requested by Tanya to offer some advice for someone who hasn’t run Comrades and wishes to run it for the very first time. The first question to ask and answer, is a question to ask and answer of oneself. Ask yourself the question: Why in the world would I want to run an 89km race like The Comrades Ultra Marathon? Very few people climb Mount Everest. Very few run Comrades. Similarly, one needs to figure out for oneself why one would want to run the Comrades Marathon. The best time to do this is before one registers for the race. I think I run the Comrades marathon because of my desire to experience the unknown within my being. My wife says that she knows everything there is to know about me. She says she knows me more than I know myself. She is wrong. I have a few secrets. Every year, at some point on the road during Comrades, I find out something new about myself. I get a new insight into myself. It is good to know a few things about oneself which no one else is privy to. People will tell you how great this race is. People will tell you how hard it is & people will tell you how long it is. People will tell you that it is one race which will pull you towards itself like a magnet, again and again, even after you have run it once. People may tell you that the race entices you into a forbidden relationship (like an illicit love affair) which you know may well lead you to your doom and yet you will run towards it, like moths flying towards fire. People will tell you how much you will “Love” The Ultimate Human Race. But these are all just words. And words are not experiences. Some things have to be experienced to be understood, much like the word “Love”. Everybody has their own definition of the word “Love”. The dictionary does too. And yet it is only your experience which makes it real for you. You will run comrades only when you feel the need to experience something completely out of the ordinary. A day will come when regular running is no longer enough. A day will come when the distance of a half or a full no longer entices you. A day will come when you want to ask new questions about your old self. A day will come when you want to discover new spaces within & without. A day will come when you want to know what you are made of. A day will come when you want to discover how far you can go. That is perhaps the day you will sign up for The Ultimate Human Race. Of course, you may have a completely different reason for running comrades. Whatever your reasons, just remember that the Ancient Greek aphorism “know thyself” applies to this endeavour as well. Examine your motives well. You will answer for them on race day. Over the last 9 years I’ve had some insights into this race. But I have come to understand that the advice I’m about to give is pretty common knowledge. But anyway. Let me write on. Registrations for Comrades opens in September but Comrades Training should ideally start in January. People sign-up in September and get into complete Comrades training mode right away. I find this hard to sustain. I would advise simple base building from Sept to Jan at which point one can start adding more aggressive volume, hills, and speed training. The peak training months are March and April and a little bit in May. The key to running multiple Comrades is to not burn out. One must conserve oneself. Pacing oneself slowly, if one wishes to last longer, is an idea which can be applied to many other aspects of life as well. Pacing is the key to endurance. Pace yourself! The Comrades marathon has a different start point each year. The start point alternates between Durban and PMB. One run is called the Up run, the other, the Down Run. The Up run is traditionally about 2k shorter than the Down run. The down run is approximately 89km while the Up is approximately 87 km. (sometimes these distances may change due to some road closures or some other issues but they are in the ball-park). However, the time given to complete both the Up run and the Down run is the same. Always 12:00 hours. I like going downhill . It’s much easier than going uphill. Nature prefers downhill. I mean rivers flow downhill, leaves fall down from trees, apples fall downwards. A ball thrown up always comes back down. Going down is natural, it’s free & less stressful. Gravity helps. Down is the natural state of things. Pharmaceutical companies, on the other hand, have to invest millions trying to make things go up. It’s hard to go to Up. And the older one gets the harder it is to go up. So just take my word for this. The down run is easier. But no matter whether it is the down run or the up run, one needs to be a strong hill climber. One does not have a choice, the first part of the down run is up. So the thing is this: if one wants to run Comrades, one needs to love running up the hills and running down the valleys. There are many downs in the up run as well. So, don’t worry too much when you are climbing up because everything that goes up has to come down and vice versa. Just learn to hang in and keep putting one feet in front of the other. A wise man once said that you can’t stand in the same river twice. A wiser man said that you can’t stand in the same river even once. The river is changing at every instant. You stand in it, and the water flows past your legs. What is gone is the past, what is about to come is the future and you are standing in the present. And yet the present is so fleeting that you can’t even call it time. The past and the future can be defined as Time but the present is simply Life. Every person who stands on the start line comes with a desire to attain something. Some simply want to finish. Some have a time target. Time flies on the road that day. Every infinitesimal moment of time is of value. Don’t waste it. Keep moving. As children we wish to grow up quickly. As age catches up we wish to become young again. We sit and wonder, where has all the time disappeared? Time disappears on the Comrades route. Use it well. Be aware that there are too many water stations and if you stop at every water station you will lose time. As the race progresses and the fatigue increases, these water stations start looking like safe havens. One starts thinking that it is only fair to walk through an aid station because it’s been provided. Remember Time flies. Stay in the present. Be aware. Keep moving. Comrades is a long race (Duh!) and the idea is that one must teach one’s body to keep running when tired. This is possible only when one has taught it to do so in training. I find that high volume is a very important ingredient of Comrades training. Some may disagree. Many people will say that they have run comrades on minimum volume. (Between January and May) Some will say 500k, some 800k, and some will say 1200k. I have come to the conclusion that I need to run more. The increase in volume normally causes most people to slow down. The Comrades marathon has multiple cut-off points. One must finish certain distance within a certain time. The half way is normally 6 hours and 10mins. I have experienced that a large number of runners get cut-off at approximately the 82k cut-off which happens around 11 hours and 20 mins. For a slow runner it’s not just endurance which is important but also speed. So do not ignore speed training. One needs to qualify for Comrades race by running a standard marathon under 5:00 hours. And one is then seeded on the comrades start line based on the qualification time submitted. The slower the runner, the further he is from the start line. Someone who qualifies with a marathon time of between 4:40-5:00 will take approximately 6-10 mins to reach the start point on race day. Those minutes are lost forever from the 12:00 hours one has to complete the race. In describing the race, all official literature will mention the names of 5 big hills. And sometimes people start thinking that Comrades just has the 5 big hills. This is like saying that if one walks from Kathmandu to the top of Mt Everest, the only mountain one will have to climb is Everest! But one cannot ignore all the other little hills which will come along the way. 5 hills have been christened! But one must understand that one is running through a valley, which is called, “The valley of a thousand hills”. And it is the nameless hills which one needs to run which will cause a lot of pain and agony. One must learn to run on a rolling terrain. Pain on race day is a given. I can promise you that everyone will experience pain whether one is a fast runner or a slow runner. The pain isn’t just physical. It is mental and emotional as well. There will come a point on the road, after 60km, when one will be alone. It will not matter that one has trained hard. It will not matter that one is a fast runner. It will not matter that one has trained brilliantly well. It will not matter where one went to school. It will not matter how many cars one owns. It will not matter how big ones house is or how beautiful ones wife is or how charming ones husband is. It will not matter how big ones bank balance is or how important you are in your day job. You will stand alone. And you will ask yourself the question: What the Fxxk is going on ? Why am I here? How can I finish this? I am in pain and I do not want to do this ! You will question the very idea of the race and will wonder why you set forth on this journey. And In those few seconds of introspection, will lie the secret to the rest of your day. Over the next few hours, some will find an inner strength they never knew they had. Some will find a resolve they never knew they had. Some will rise to the occasion. And some will hang their heads, put their hands on their hips and get into the bail-bus. Some will get cut-off against a time limit. But does it really matter how you end the day? Yes and No. Everyone wants to be rewarded for all the hard work they have put in over months and months of training and the pride and the satisfaction of having gone the distance is an awesome reward and so is the medal. But many who start the day won’t finish. Some will cramp, some will puke, some will get cut-off and some will just give up and some will end up in the hospital tent. It does not matter if one finishes or not because the race is as much about one’s inner-journey as it is about the external one. You’re on that road, alone. You have to cross it alone on your own two feet. Your fellow runners may help, your family may pray, and supporters on the road may cheer but it is you who has to keep putting one step in front of the other and it is you who has to answer the question when the pain inevitably hits you: Why am I here ? And whether you finish the race or not and whether you finish it in a time of your choosing or not, it does not matter. It does not matter because it is the journey which will forever change your attitude to life. The race strips you of everything. It strips you of all that you have used to define yourself with your entire life, until that moment. It lays you bare. It strips you to your core and then allows you to rebuild yourself. The reason one comes back to run comrades is that one wants to revisit that point of time. The point of time where one was stripped of everything. One comes back to revisit that moment in time, when one was on the road stripped of all privileges, when one had the free will to decided how the rest of the day would unfold. One goes back because one wants to re-experience that infinitesimal moment of time, when one had to look deep inside oneself and search for an existential answer. You can find that answer on that road between Durban and PMB. Amit Sheth, the writer behind this beautiful piece on Comrades, is the author of the book, Dare to Run. He is also the recipient of the Spirit of Comrades award. He has run numerous marathons & ultra marathons around the world. 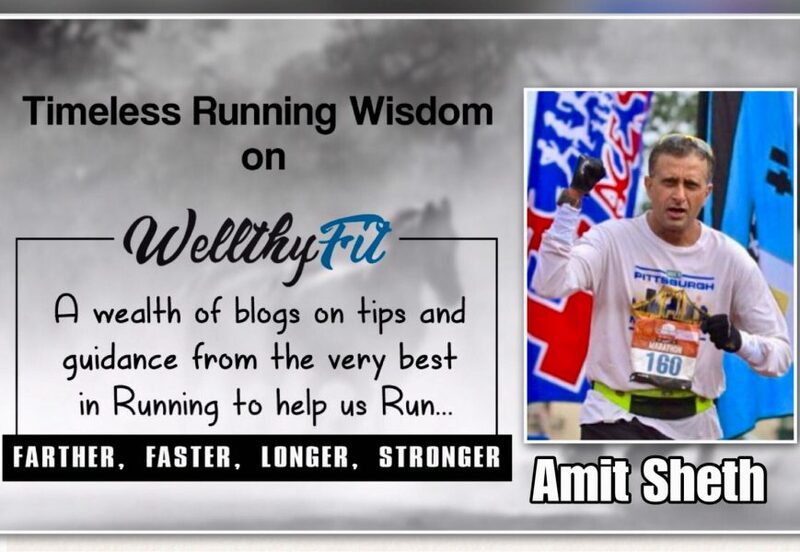 This is indeed a wonderful article and i will definitely purchase your Book Mr Amit as well as Run the comrades…. may be to rediscover myself ! thanks a lot for this article !